Not to be confused with Thymine. Thiamine, also known as thiamin or vitamin B1, is a vitamin found in food, and manufactured as a dietary supplement and medication. Food sources of thiamine include whole grains, legumes, and some meats and fish. Grain processing removes much of the thiamine content, so in many countries cereals and flours are enriched with thiamine. Supplements and medications are available to treat and prevent thiamine deficiency and disorders that result from it, including beriberi and Wernicke encephalopathy. Other uses include the treatment of maple syrup urine disease and Leigh syndrome. They are typically taken by mouth, but may also be given by intravenous or intramuscular injection. Thiamine supplements are generally well tolerated. Allergic reactions, including anaphylaxis, may occur when repeated doses are given by injection. Thiamine is in the B complex family. It is an essential micronutrient, which cannot be made in the body. Thiamine is required for metabolism including that of glucose, amino acids, and lipids. Thiamine was discovered in 1897, was the first vitamin to be isolated in 1926, and was first made in 1936. It is on the World Health Organization's List of Essential Medicines, the most effective and safe medicines needed in a health system. Thiamine is available as a generic medication, and as an over-the-counter drug. The wholesale cost in the developing world (as of 2016) is about US$2.17 per one gm vial. In the United States a month's supply of a multivitamin containing thiamine is less than US$25. Thiamine is used to treat thiamine deficiency which when severe can prove fatal. In less severe cases, non-specific signs include malaise, weight loss, irritability and confusion. Well-known disorders caused by thiamine deficiency include beriberi, Wernicke-Korsakoff syndrome, optic neuropathy, Leigh's disease, African Seasonal Ataxia, and central pontine myelinolysis. It has also been suggested that thiamine deficiency plays a role in the poor development of the infant brain that can lead to sudden infant death syndrome (SIDS). In Western countries, thiamine deficiency is seen mainly in chronic alcoholism. Also at risk are older adults, persons with HIV/AIDS or diabetes, and persons who have had bariatric surgery. Varying degrees of thiamine deficiency have been associated with the long-term use of high doses of diuretics, particularly furosemide in the treatment of heart failure. Thiamine deficiency is often present in alcohol misuse disorder. Thiamine is a treatment for some types of maple syrup urine disease and Leigh disease. Adverse effects are generally few. Allergic reactions including anaphylaxis may occur. Thiamine is a colorless organosulfur compound with a chemical formula C12H17N4OS. Its structure consists of an aminopyrimidine and a thiazolium ring linked by a methylene bridge. The thiazole is substituted with methyl and hydroxyethyl side chains. Thiamine is soluble in water, methanol, and glycerol and practically insoluble in less polar organic solvents. It is stable at acidic pH, but is unstable in alkaline solutions. Thiamine, which is a persistent carbene, is used by enzymes to catalyze benzoin condensations in vivo. Thiamine is unstable to heat, but stable during frozen storage. It is unstable when exposed to ultraviolet light and gamma irradiation. Thiamine reacts strongly in Maillard-type reactions. Complex thiamine biosynthesis occurs in bacteria, some protozoans, plants, and fungi. The thiazole and pyrimidine moieties are biosynthesized separately and then combined to form thiamine monophosphate (ThMP) by the action of thiamine-phosphate synthase (EC2.5.1.3). The biosynthetic pathways may differ among organisms. In E. coli and other enterobacteriaceae, ThMP may be phosphorylated to the cofactor thiamine diphospate (ThDP) by a thiamine-phosphate kinase (ThMP + ATP → ThDP + ADP, EC 2.7.4.16). In most bacteria and in eukaryotes, ThMP is hydrolyzed to thiamine, which may then be pyrophosphorylated to ThDP by thiamine diphosphokinase (thiamine + ATP → ThDP + AMP, EC 2.7.6.2). The biosynthetic pathways are regulated by riboswitches. If there is sufficient thiamine present in the cell then the thiamine binds to the mRNAs for the enzymes that are required in the pathway and prevents their translation. If there is no thiamine present then there is no inhibition, and the enzymes required for the biosynthesis are produced. The specific riboswitch, the TPP riboswitch (or ThDP), is the only riboswitch identified in both eukaryotic and prokaryotic organisms. Thiamine is found in a wide variety of processed and whole foods, with edible seeds, legumes, rice, pork, and processed foods, such as breakfast cereals, having among the highest contents. In the U.S. the Estimated Average Requirements (EARs) and Recommended Dietary Allowances (RDAs) for thiamine were updated in 1998, by the Institute of Medicine now known as the National Academy of Medicine (NAM). The European Food Safety Authority (EFSA) refers to the collective set of information as Dietary Reference Values, with Population Reference Intake (PRI) instead of RDA, and Average Requirement instead of EAR. AI and UL defined the same as in United States. For women (including those pregnant or lactating), men and children the PRI is 0.1 mg thiamine per megajoule (MJ) of energy consumed. As the conversion is 1 MJ = 238.8 kcal, an adult consuming 2388 calories should be consuming 1.0 mg thiamine. This is slightly lower than the U.S. RDA. The EFSA reviewed the same safety question and also reached the conclusion that there was not sufficient evidence to set a UL for thiamine. For U.S. food and dietary supplement labeling purposes the amount in a serving is expressed as a percentage of Daily Value (%DV). For thiamine labeling purposes 100% of the Daily Value was 1.5 mg, but as of May 27, 2016 it was revised to 1.2 mg to bring it into agreement with the RDA. A table of the old and new adult Daily Values is provided at Reference Daily Intake. The original deadline to be in compliance was July 28, 2018, but on September 29, 2017 the FDA released a proposed rule that extended the deadline to January 1, 2020 for large companies and January 1, 2021 for small companies. Refining grain removes its bran and germ, and thus subtracts its naturally occurring vitamins and minerals. In the United States, B-vitamin deficiencies became common in the first half of the 20th century due to white flour consumption. The American Medical Association successfully lobbied for restoring these vitamins by enrichment of grain, which began in the US in 1939. The UK followed in 1940 and Denmark in 1953. As of 2016, about 85 countries had passed legislation mandating fortification of wheat flour with at least some nutrients, and 28% of industrially milled flour was fortified, often with thiamine and other B vitamins. Thiamine is released by the action of phosphatase and pyrophosphatase in the upper small intestine. At low concentrations, the process is carrier-mediated. At higher concentrations, absorption also occurs via passive diffusion. Active transport is greatest in the jejunum and ileum, but it can be inhibited by alcohol consumption or by folate deficiency. Decline in thiamine absorption occurs at intakes above 5 mg/day. On the serosal side of the intestine, discharge of the vitamin by those cells is dependent on Na+-dependent ATPase. Uptake of thiamine by cells of the blood and other tissues occurs via active transport and passive diffusion. About 80% of intracellular thiamine is phosphorylated and most is bound to proteins. Two members of the SLC gene family of transporter proteins, SLC19A2 and SLC19A3, are capable of the thiamine transport. In some tissues, thiamine uptake and secretion appears to be mediated by a soluble thiamine transporter that is dependent on Na+ and a transcellular proton gradient. Human storage of thiamine is about 25 to 30 mg, with the greatest concentrations in skeletal muscle, heart, brain, liver, and kidneys. ThMP and free (unphosphorylated) thiamine is present in plasma, milk, cerebrospinal fluid, and, it is presumed, all extracellular fluid. Unlike the highly phosphorylated forms of thiamine, ThMP and free thiamine are capable of crossing cell membranes. Calcium and Magnesium have been shown to affect the distribution of thiamine in the body and Magnesium has been shown to aggravate thiamine deficiency. Thiamine contents in human tissues are less than those of other species. Its phosphate derivatives are involved in many cellular processes. The best-characterized form is thiamine pyrophosphate (TPP), a coenzyme in the catabolism of sugars and amino acids. In yeast, TPP is also required in the first step of alcoholic fermentation. All organisms use thiamine, but it is made only in bacteria, fungi, and plants. Animals must obtain it from their diet, and thus, for humans, it is an essential nutrient. Insufficient intake in birds produces a characteristic polyneuritis. The enzymes transketolase, pyruvate dehydrogenase (PDH), and 2-oxoglutarate dehydrogenase (OGDH) are all important in carbohydrate metabolism. The cytosolic enzyme transketolase is a key player in the pentose phosphate pathway, a major route for the biosynthesis of the pentose sugars deoxyribose and ribose. The mitochondrial PDH and OGDH are part of biochemical pathways that result in the generation of adenosine triphosphate (ATP), which is a major form of energy for the cell. PDH links glycolysis to the citric acid cycle, while the reaction catalyzed by OGDH is a rate-limiting step in the citric acid cycle. In the nervous system, PDH is also involved in the production of acetylcholine, a neurotransmitter, and for myelin synthesis. Thiamine triphosphate (ThTP) was long considered a specific neuroactive form of thiamine, playing a role in chloride channels in the neurons of mammals and other animals, although this is not completely understood. However, recently it was shown that ThTP exists in bacteria, fungi, plants and animals suggesting a much more general cellular role. In particular in E. coli, it seems to play a role in response to amino acid starvation. Thiamine was the first of the water-soluble vitamins to be described, leading to the discovery of more essential nutrients and to the notion of vitamin. In 1884, Takaki Kanehiro (1849–1920), a surgeon general in the Japanese navy, rejected the previous germ theory for beriberi and hypothesized that the disease was due to insufficiencies in the diet instead. Switching diets on a navy ship, he discovered that replacing a diet of white rice only with one also containing barley, meat, milk, bread, and vegetables, nearly eliminated beriberi on a nine-month sea voyage. However, Takaki had added many foods to the successful diet and he incorrectly attributed the benefit to increased nitrogen intake, as vitamins were unknown substances at the time. The Navy was not convinced of the need for so expensive a program of dietary improvement, and many men continued to die of beriberi, even during the Russo-Japanese war of 1904–5. Not until 1905, after the anti-beriberi factor had been discovered in rice bran (removed by polishing into white rice) and in barley bran, was Takaki's experiment rewarded by making him a baron in the Japanese peerage system, after which he was affectionately called "Barley Baron". The specific connection to grain was made in 1897 by Christiaan Eijkman (1858–1930), a military doctor in the Dutch Indies, who discovered that fowl fed on a diet of cooked, polished rice developed paralysis, which could be reversed by discontinuing rice polishing. He attributed beriberi to the high levels of starch in rice being toxic. He believed that the toxicity was countered in a compound present in the rice polishings. An associate, Gerrit Grijns (1865–1944), correctly interpreted the connection between excessive consumption of polished rice and beriberi in 1901: He concluded that rice contains an essential nutrient in the outer layers of the grain that is removed by polishing. Eijkman was eventually awarded the Nobel Prize in Physiology and Medicine in 1929, because his observations led to the discovery of vitamins. In 1910 a Japanese scientist Umetaro Suzuki first isolated the compound which he described as aberic acid. In translation from the Japanese paper in which it was claimed to be a new finding this claim was omitted. In 1911 a Polish biochemist Casimir Funk isolated the antineuritic substance from rice bran (the modern thiamine) that he called a "vitamine" (on account of its containing an amino group. However, Funk did not completely characterize its chemical structure. Dutch chemists, Barend Coenraad Petrus Jansen (1884–1962) and his closest collaborator Willem Frederik Donath (1889–1957), went on to isolate and crystallize the active agent in 1926, whose structure was determined by Robert Runnels Williams (1886–1965), a US chemist, in 1934. Thiamine was named by the Williams team as "thio" or “sulfur-containing vitamin”, with the term "vitamin" coming indirectly, by way of Funk, from the amine group of thiamine itself (by this time in 1936, vitamins were known to not always be amines, for example, vitamin C). Thiamine was synthesized in 1936 by the Williams group. Thiamine was first named "aneurin" (for anti-neuritic vitamin). Sir Rudolph Peters, in Oxford, introduced thiamine-deprived pigeons as a model for understanding how thiamine deficiency can lead to the pathological-physiological symptoms of beriberi. Indeed, feeding the pigeons upon polished rice leads to an easily recognizable behavior of head retraction, a condition called opisthotonos. If not treated, the animals died after a few days. Administration of thiamine at the stage of opisthotonos led to a complete cure within 30 minutes. As no morphological modifications were observed in the brain of the pigeons before and after treatment with thiamine, Peters introduced the concept of a biochemical lesion. When Lohman and Schuster (1937) showed that the diphosphorylated thiamine derivative (thiamine diphosphate, ThDP) was a cofactor required for the oxydative decarboxylation of pyruvate, a reaction now known to be catalyzed by pyruvate dehydrogenase, the mechanism of action of thiamine in the cellular metabolism seemed to be elucidated. At present, this view seems to be oversimplified: pyruvate dehydrogenase is only one of several enzymes requiring thiamine diphosphate as a cofactor; moreover, other thiamine phosphate derivatives have been discovered since then, and they may also contribute to the symptoms observed during thiamine deficiency. Lastly, the mechanism by which the thiamine moiety of ThDP exerts its coenzyme function by proton substitution on position 2 of the thiazole ring was elucidated by Ronald Breslow in 1958. ^ a b c d e f g h i j k American Society of Health-System Pharmacists. "Thiamine Hydrochloride". Drugsite Trust (Drugs.com). Retrieved 17 April 2018. ^ a b c d e f "Office of Dietary Supplements - Thiamin". ods.od.nih.gov. 11 February 2016. Archived from the original on 30 December 2016. Retrieved 30 December 2016. ^ "Thiamine: MedlinePlus Drug Information". medlineplus.gov. Retrieved 30 April 2018. ^ Guidelines on food fortification with micronutrients (PDF). WHO and FAO. 2006. pp. 13–14. ISBN 92 4 159401 2. Retrieved 5 May 2018. ^ "Thiamine". www.drugbank.ca. Retrieved 30 April 2018. ^ Constable, Peter D.; Hinchcliff, Kenneth W.; Done, Stanley H.; Gruenberg, Walter (2017). Diseases of the Nervous System - Veterinary Medicine (Eleventh Edition) - 14. pp. 1155–1370. ISBN 978-0-7020-5246-0. Thiamine (vitamin B1) is synthesized only in bacteria, fungi, and plants but is an essential nutrient for animals. ^ Squires, Victor R. (2011). The Role of Food, Agriculture, Forestry and Fisheries in Human Nutrition - Volume IV. EOLSS Publications. p. 121. ISBN 9781848261952. Archived from the original on 30 December 2016. ^ "Vitamin B1". International Drug Price Indicator Guide. Retrieved 8 December 2016. ^ Hamilton, Richart (2015). Tarascon Pocket Pharmacopoeia 2015 Deluxe Lab-Coat Edition. Jones & Bartlett Learning. p. 230. ISBN 9781284057560. ^ a b c d e f g Mahan, LK; Escott-Stump, S, eds. (2000). Krause's food, nutrition, & diet therapy (10th ed.). Philadelphia: W.B. Saunders Company. ISBN 978-0-7216-7904-4. ^ a b c d e f g Combs, GF Jr. (2008). The Vitamins: Fundamental Aspects in Nutrition and Health (3rd ed.). Ithaca, NY: Elsevier Academic Press. ISBN 978-0-12-183493-7. ^ McCandless, David (2010). Thiamine Deficiency and Associate Clinical Disorders. New York, NY: Humana Press. pp. 157–159. ISBN 978-1-60761-310-7. ^ Lonsdale, Derrick (2006). "A Review of the Biochemistry, Metabolism and Clinical Benefits of Thiamin(e) and Its Derivatives". Evid Based Complement Alternat Med. 6. ^ The Editors of Encyclopaedia Britannica (19 December 2017). "Beriberi". Encyclopædia Britannica. Retrieved 13 April 2018. ^ Katta, N; Balla, S; Alpert, MA (July 2016). "Does Long-Term Furosemide Therapy Cause Thiamine Deficiency in Patients with Heart Failure? A Focused Review". The American Journal of Medicine. 129 (7): 753.e7–753.e11. doi:10.1016/j.amjmed.2016.01.037. PMID 26899752. ^ "Vitamin B1 (Thiamine)". Medicine LibreTexts. 12 May 2017. ^ Webb, ME; Marquet, A; Mendel, RR; Rébeillé, F; Smith, AG (2007). "Elucidating biosynthetic pathways for vitamins and cofactors". Nat Prod Rep. 24 (5): 988–1008. doi:10.1039/b703105j. PMID 17898894. ^ Begley, TP; Chatterjee, A; Hanes, JW; Hazra, A; Ealick, SE (2008). "Cofactor biosynthesis—still yielding fascinating new biological chemistry". Current Opinion in Chemical Biology. 12 (2): 118–125. doi:10.1016/j.cbpa.2008.02.006. PMC 2677635. PMID 18314013. ^ Bocobza, Samuel; Aharoni, Asaph (2008). "Switching the light on plant riboswitches". Trends in Plant Science. 13 (10): 526–533. doi:10.1016/j.tplants.2008.07.004. PMID 18778966. ^ "Thiamin content per 100 grams; select food subset, abridged list by food groups". United States Department of Agriculture, Agricultural Research Service, USDA Branded Food Products Database v.3.6.4.1. 17 January 2017. Archived from the original on 2 February 2017. Retrieved 27 January 2017. ^ "Thiamin, Food sources". Micronutrient Information Center, Linus Pauling Institute, Oregon State University, Corvallis, OR. 2013. Archived from the original on 2 February 2017. Retrieved 27 January 2017. ^ a b c Institute of Medicine (1998). "Thiamin". Dietary Reference Intakes for Thiamin, Riboflavin, Niacin, Vitamin B6, Folate, Vitamin B12, Pantothenic Acid, Biotin, and Choline. Washington, DC: The National Academies Press. pp. 58–86. ISBN 978-0-309-06554-2. Archived from the original on 16 July 2015. Retrieved 29 August 2017. ^ "Overview on Dietary Reference Values for the EU population as derived by the EFSA Panel on Dietetic Products, Nutrition and Allergies" (PDF). 2017. Archived (PDF) from the original on 28 August 2017. ^ "Federal Register May 27, 2016 Food Labeling: Revision of the Nutrition and Supplement Facts Labels. FR page 33982" (PDF). Archived (PDF) from the original on 8 August 2016. ^ Lonsdale, Derrick (2006). "A Review of the Biochemistry, Metabolism and Clinical Benefits of Thiamin(e) and Its Derivatives". Evid Based Complement Alternat Med. 3 (1): 49–59. doi:10.1093/ecam/nek009. PMC 1375232. PMID 16550223. ^ a b Lonsdale, Derrick (2006). "A Review of the Biochemistry, Metabolism and Clinical Benefits of Thiamin(e) and Its Derivatives". Evid Based Complement Alternat Med. 3. ^ Bettendorff L.; Mastrogiacomo F.; Kish S. J.; Grisar T. (1996). "Thiamine, thiamine phosphates and their metabolizing enzymes in human brain". J. Neurochem. 66 (1): 250–258. doi:10.1046/j.1471-4159.1996.66010250.x. PMID 8522961. ^ Makarchikov AF, Lakaye B, Gulyai IE, Czerniecki J, Coumans B, Wins P, Grisar T, Bettendorff L (2003). "Thiamine triphosphate and thiamine triphosphatase activities: from bacteria to mammals". Cell. Mol. Life Sci. 60 (7): 1477–1488. doi:10.1007/s00018-003-3098-4. PMID 12943234. ^ Lakaye B, Wirtzfeld B, Wins P, Grisar T, Bettendorff L (2004). "Thiamine triphosphate, a new signal required for optimal growth of Escherichia coli during amino acid starvation". J. Biol. Chem. 279 (17): 17142–17147. doi:10.1074/jbc.M313569200. PMID 14769791. ^ Bettendorff L, Wirtzfeld B, Makarchikov AF, Mazzucchelli G, Frédérich M, Gigliobianco T, Gangolf M, De Pauw E, Angenot L, Wins P (2007). 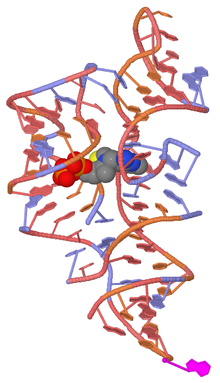 "Discovery of a natural thiamine adenine nucleotide". Nature Chemical Biology. 3 (4): 211–212. doi:10.1038/nchembio867. PMID 17334376. ^ a b Frédérich M; Delvaux D; Gigliobianco T; Gangolf M; Dive G; Mazzucchelli G; Elias B; De Pauw E; Angenot L; Wins P; Bettendorff L. (2009). "Thiaminylated adenine nucleotides. Chemical synthesis, structural characterization and natural occurrence". FEBS Journal. 276 (12): 3256–3268. doi:10.1111/j.1742-4658.2009.07040.x. PMID 19438713. ^ McCollum EV. A History of Nutrition. Cambridge, Massachusetts: Riverside Press, Houghton Mifflin; 1957. ^ Eijkman, C. (1897). "Eine Beriberiähnliche Krankheit der Hühner". Archiv für Pathologische Anatomie und Physiologie und für Klinische Medizin. 148 (3): 523–532. doi:10.1007/BF01937576. ^ "The Nobel Prize and the Discovery of Vitamins". www.nobelprize.org. ^ Grijns, G. (1901). "Over polyneuritis gallinarum". Geneesk. Tijdscht. Ned. Ind. 43: 3–110. ^ Williams, R.R. ; Cline, J.K. (1936). "Synthesis of vitamin B1". J. Am. Chem. Soc. 58 (8): 1504–1505. doi:10.1021/ja01299a505. ^ Peters, R.A. (1936). "The biochemical lesion in vitamin B1deficiency. Application of modern biochemical analysis in its diagnosis". Lancet. 1 (5882): 1161–1164. doi:10.1016/S0140-6736(01)28025-8. ^ Breslow R (1958). "On the mechanism of thiamine action. IV.1 Evidence from studies on model systems". J Am Chem Soc. 80 (14): 3719–3726. doi:10.1021/ja01547a064.